A few months ago I wrote about the upcoming opening of Breadsmith in Brooklyn. Well, yesterday was the day of their Grand Opening, and I swung by in the afternoon to give the place a look and see if they lived up to my extremely high expectations (thank you South Bend Breadsmith for setting them that high). Here is a review of some of the products I bought, as well as their “price list/daily specials”. With most of their bread products, they sell a “loaf” and “roll” versions, which will let you taste them for a lot cheaper without investing in an expensive loaf of something you are uncertain of. As you can see from the list at the bottom, they have a wide range of pastries, but I chose to stick to cookies for yesterday. Overall they the store looked really nice, their products looked really good as well. I personally stayed away from the really fancy stuff for Day 1, wanting to try out their base (and daily) products first, figuring that if you can’t do your staples well, you probably won’t make it. Be sure to pick up a BREAD CARD while you are there, as every 12 loaves you buy, you get one free. 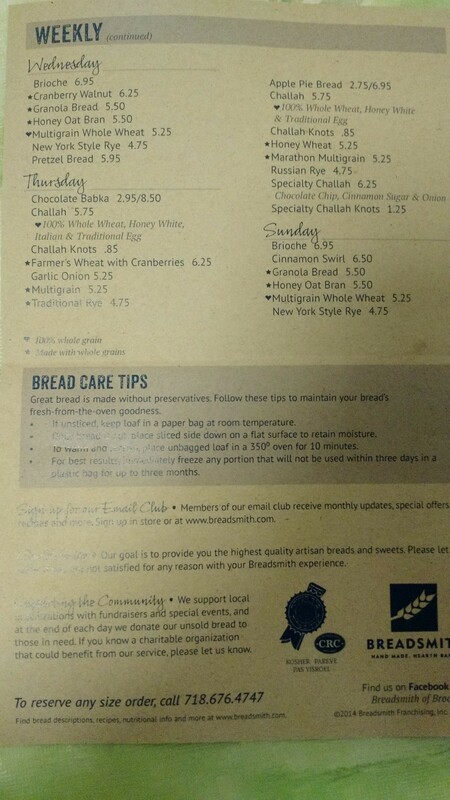 While their Challahs are fairly expensive, and I know we won’t be getting (since all of us wouldn’t eat from it), but families who need a few challahs, that buy 12 get 1 will work out nicely for them. OVERALL – 3.5 out of 5 for their Opening Rating. 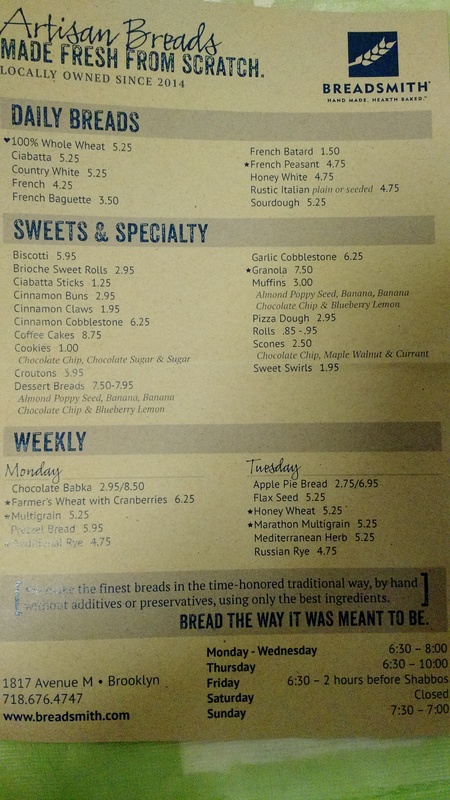 Daily Breads, Sweets & Specialties, and Monday/Tuesday specials. Specials for Wednesday/Thursday/Friday/Sunday (Friday top right, not labeled). ← Travel Poll – Traffic or Time On Road?